Pizza! It’s my family’s most requested meal. For special occasions, for when company is coming over, and for both-kids-have-afternoon-activities-and-I-haven’t-thought-about-dinner-yet nights, pizza reigns supreme. I spend an afternoon making a boatload of dough, and then I cut them into individual balls and put them in bags in the freezer for later. It’s a rare moment when I don’t have pizza dough for an army in my freezer! Did you know pizza dough freezes well? As a matter of fact, I almost prefer it frozen first! I think it’s that slow thaw that does something to the yeast… I don’t know the science behind it, but it’s always tasty. The pizza pictured above is one of about 31 gagillion different variations I’ve made with pizza dough. I’ll blog about my favorite white flour dough later, but right now the one I’m digging is this whole wheat version. Winter makes a good case for craving all things hearty and earthy. This dough is perfect for layering strong cheeses and sweet fruits to counteract salty meats. 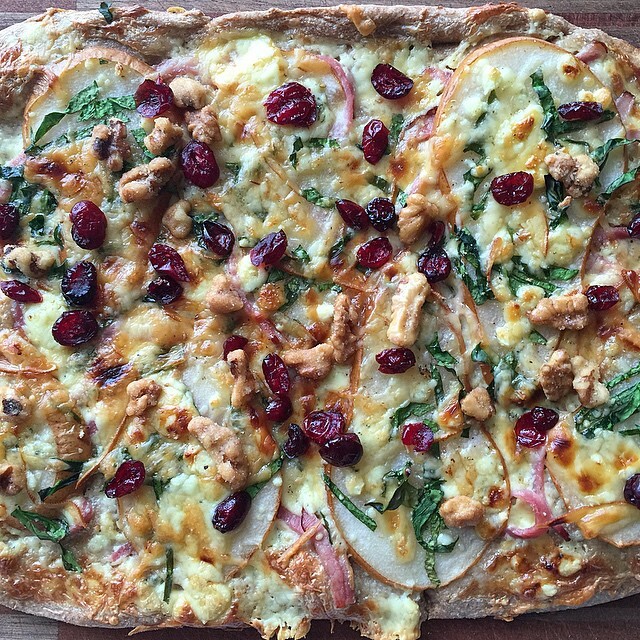 I made this pizza with a creamy brie spread thinly on the base (no sauce), then layers of manchego, gouda and blue cheeses with thinly sliced pear, julienne spinach, local thinly sliced ham, candied walnuts, dried cranberries, a drizzle of honey and a few cracks of pepper (the cranberries and walnuts were sprinkled after cooking). It was a big hit with our friends from out of town. I always like to serve several different types of pizza when friends come over. A typical pizza you’d find on any menu, a kid-friendly version, and one for the adventurous spirit (or to prove to a non-adventurous person that it’s worth it to try new things once in a while). On the other end of the spectrum is the “I have nothing else for dinner but a fridge full of less-than-two-servings of random veggies.” That’s when I make a kitchen sink pizza. No one complains, and I get to feel good about not wasting all those things in the fridge! What’s your favorite pizza combination? Are you a red sauce fan or do you like to change it up? For this whole wheat recipe, first I “bloom” the yeast in a mixing bowl with warm water and a good pinch of sugar. When other recipes say “warm water” when yeast is involved, keep in mind that it’s referring to a temperature of 105-110 degrees F. Yeast cells die at 130F so if you keep a candy thermometer in your kitchen, do a quick check. To me it feels like in between a bath I’d give my littles and a bath I’d give myself with a magazine and a glass of red (warmer than “lukewarm” but not “hot”). There’s debate on whether sugar helps yeast bloom in a recipe like this, but I throw in a good pinch for the sake of “just in case.” It works for me this way, so I’ll continue! This is what it looks like when you leave the yeast, sugar and warm water for 5-10 minutes. It “blooms,” and if you’re standing right above it, you’ll smell it right away as it starts to bubble and foam. That typical yeast/bread smell is intoxicating! 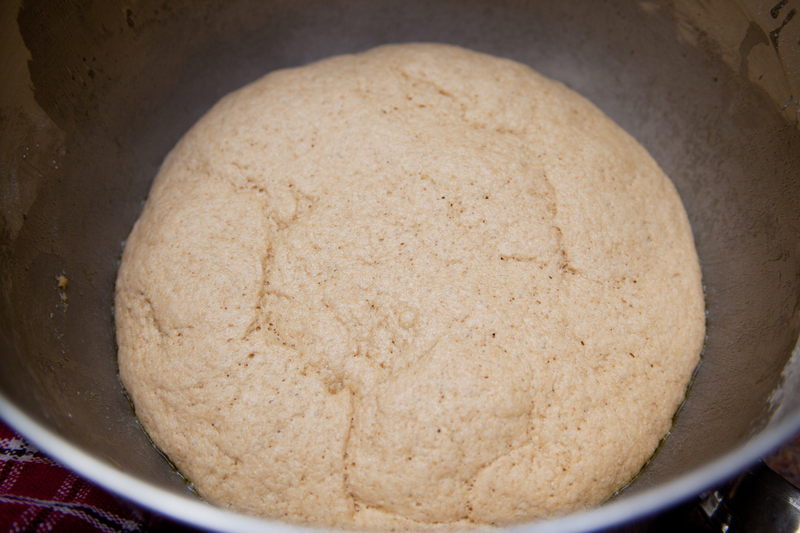 After you’ve seen the yeast bloom, add a little olive oil and a good spoon of salt, then add your whole wheat flour. 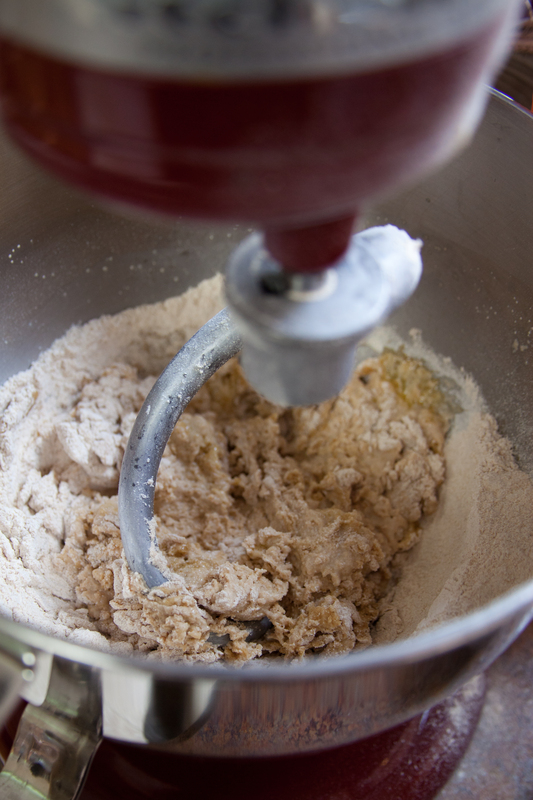 Use the dough hook on your mixer (or be prepared for an arm workout if you don’t have a mixer). Let it knead until it’s pretty safe to say it’s all come together. The dough should be moist and tacky, but shouldn’t stick to your finger when you press it. If you it does stick, add just a few tablespoons of flour at a time in the mixer until it’s right. When it’s the way you want it, take the ball out of the mixing bowl, and holding it in one hand, drizzle a few teaspoons of olive oil in the mixing bowl. 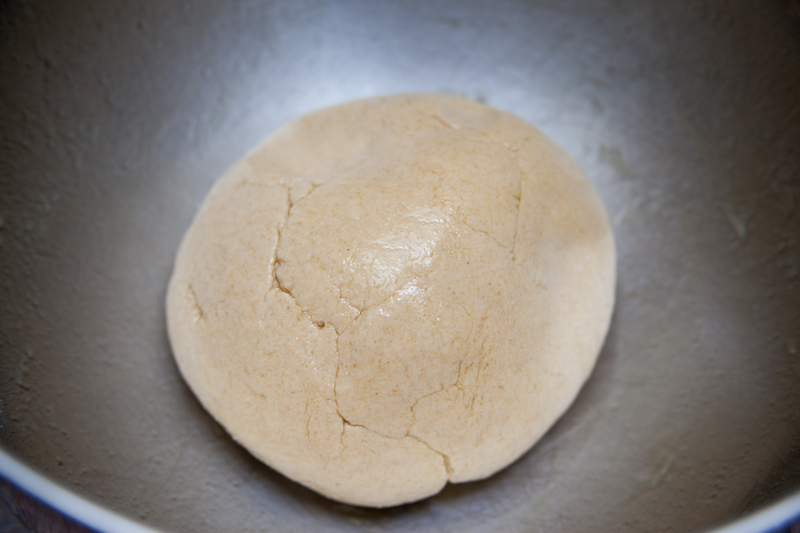 Pat the dough into a ball and place it back in the bowl, and swirl it all around until the inside of the bowl and the dough ball are both lightly coated with the oil. Cover with a *lightly* damp dish cloth (I have a water spray bottle I use to tame my son’s fantastic bed head in the mornings and I use this to spray the cloth a few times after I cover the bowl). Set aside for a 2 hour rise. (TIP! If you don’t have 2 hours, you can set the covered bowl in your oven, set it on any temperature and let it start to heat up for a few minutes, then turn it back off- you just want the oven to warm up, not cook the dough. Keep the dough in there for an hour with the door shut, and it should be close to doubled in size. The rule with yeast is the longer the rise, the more flavorful the dough, but when you’re in a crunch for time and you’re going to top the dough with plenty of flavor, go with this faster method!) This is what it should look like after 2 hours. Bubbled and doubled… At this point, punch it down, knead it out a minute or two and press it into your pan, throw it in the bottom rack of your oven on a super hot temperature, and watch that pizza bubble and brown into a masterpiece! 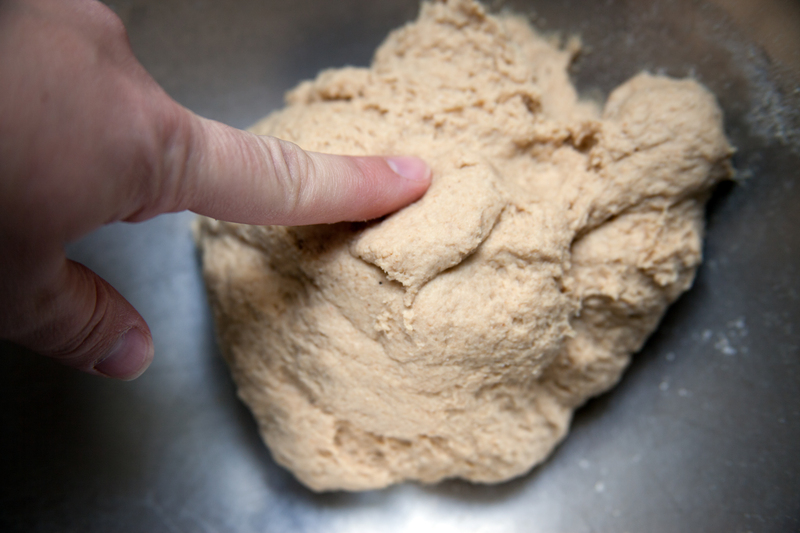 I’ve found whole wheat dough doesn’t really give you enough elasticity to throw it in the air like a pro, so skip that fun step with this recipe, and just press it out. I’ve even been known to use a rolling pin sometimes (but don’t tell my Italian BFF). Click the link below this photo to steal the recipe! 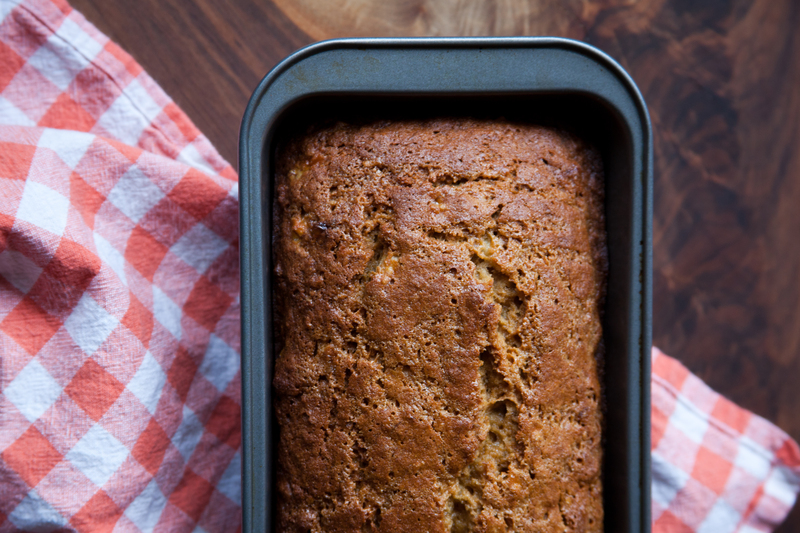 CLICK HERE TO VIEW AND PRINT THE FULL RECIPE!